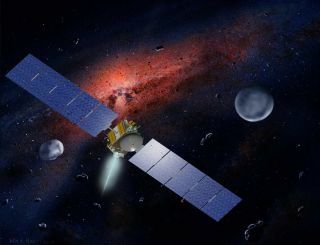 An artist's concept of NASA's Dawn spacecraft. The asteroid Vesta, which the craft has already left, is on the left. Dawn will reach Ceres, shown on the right, in March 2015. In March of 2015, NASA's Dawn missionwill arrive at the dwarf planet Ceres, the first of the smaller class of planets to be discovered and the closest to Earth. The dwarf planet Ceres, which orbits the sun in the asteroid belt between Mars and Jupiter, is a unique body in the solar system, bearing many similarities to Jupiter's moon Europaand Saturn's moon Enceladus, both considered to be potential sources for harboring life. The dwarf planet Ceres as seen by the Hubble Space Telescope. "I think of Ceres actually as a game changer in the solar system," Schmidt said. "Ceres is arguably the only one of its kind." When Ceres was discovered in 1801, astronomers first classified it as a planet. The massive body traveled between Mars and Jupiter, where scientists had mathematically predicted a planet should lie. Further observations revealed that a number of small bodies littered the region, and Ceres was downgraded to just another asteroid within the asteroid belt. It wasn't until Pluto was classified as a dwarf planetin 2006 that Ceres was upgraded to the same level. Unlike other asteroids, the Texas-sized Cereshas a perfectly rounded shape that hints toward its origins. "The fact that Ceres is so round tells us that it almost certainly had to form in the early solar system," Schmidt said. She explained that a later formation would have created a less rounded shape. The shape of the dwarf planet, combined with its size and total mass, reveal a body of incredibly low density. Less than three times as far as Earth from the sun, Ceres is close enough to feel the warmth of the star, allowing ice to melt and reform. Investigating the interior of the dwarf planet could provide insight into the early solar system, especially locations where water and other volatiles might have existed. Ceres rotates about once every nine hours. As large as Ceres is, its distance has made it a challenge to study from Earth. Images taken by the space-based Hubble Space Telescope provided some insight to its surface, but to be sighted, features could be no larger than 25 kilometers (15.5 miles) in diameter. Several round circular spots mar the terrain, features which Schmidt said could be any one of a number of geologic terrains, including potentially impact basins or chaos terrains similar to those found on Europa. The largest of these, named Piazzi in honor of the dwarf planet's discoverer, has a diameter of about 250 km (155 miles). If this feature is an impact basin, it would have been formed by an object approximately 25 km (15.5 miles) in size. But for Schmidt, this is another possible indication about the dwarf planet's surface. "It doesn't mean that Ceres hasn't been hit by something bigger than 25 kilometers," she said. "It just means that whatever is going on on Ceres has totally erased [the topographic signature of that event]." Telescopes on Earth have also been able to study the light reflecting from the planet and read its spectra. "The spectrum is telling you that water has been involved in the creation of materials on the surface," Schmidt said. "[Water is] literally bathing the surface of Ceres," she said. A prime site for life? "The chemistry, thermal activity, the heat source, and the prospect for convection within the ice shell are the key ones that make us think that Ceres could have been habitableat least at some point in its history," Castillo-Rogez said. "It's not a difficult environment to investigate," she said. "As we think about the future of landed missions for people and rovers, why not go to Ceres?" Though it would be more challenging to drill into than Europa, which boasts an icy surface layer, the dwarf planet would make a great site to rove around on. Schmidt also noted that it could make a great launching point when it comes to reaching the outer solar system. Its smaller mass would make it easier to land on — and leave — than Mars, which could make it a good site for manned missions. Castillo-Rogez pointed out that not only will Dawn reach Ceres in 2015, the European Space Agency's Rosetta spacecraft will be escorting the comet Churyumov-Gerasimenko around the sun that year, while NASA's New Horizons mission will be reaching Pluto and its moon Charon. "'15 is going to be a great year for icy bodies," Castillo-Rogez said. "I think when we get to Ceres, it's just going to be an absolute game changer, a new window into the solar system that we wouldn't have without going there," Schmidt said.